Do you remember the Dr. Hook song on the cover of the Rolling Stone where the group sings about what it would be like to see their smiling faces on the cover of The Rolling Stone Magazine? Well, hopefully you do, because I have my own set of lyrics to the same song. I just want to see my words of wisdom on the front page of the Google search! 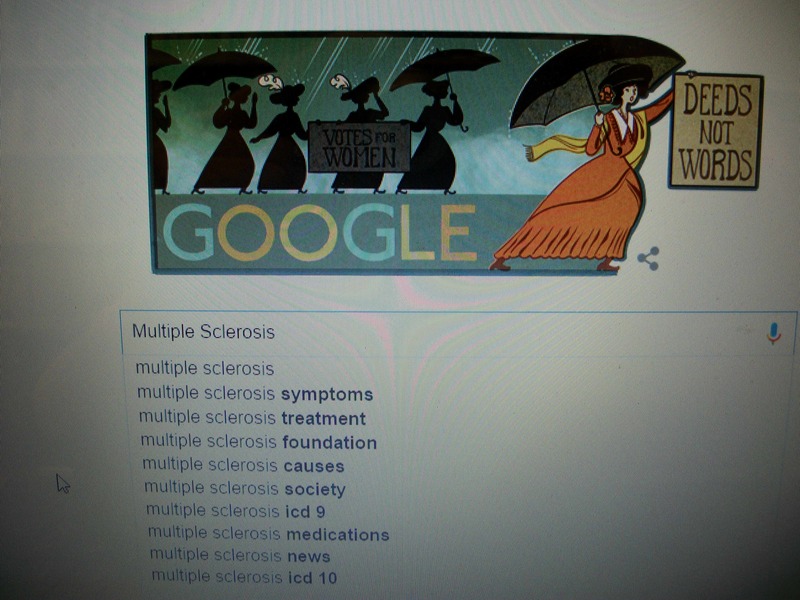 If you ever have Googled multiple sclerosis the first thing you will notice is that there are more than 22,500,000 results that you can search. In my case I just wanted to see how far I would have to go to find something that I had written that might have made it to the top of that list. And, so I don’t keep you in suspense, the answer is zero in the first 26 pages. However, briefly, here is what I did find in those first 26 pages. The first honor on the top of the very first search page goes to The National MS Society with an article entitled, What is MS? Fair enough, can’t argue much with that. The second one goes to the Mayo Clinic and an overview about MS. And the third one down was from Web MD with a similar article. And I found that all three were pretty good as general information for anyone who was just starting their search about multiple sclerosis and what we currently know about the disease, which is still very darn little. The second page of results is much the same as the first but also has a few entries from medical journals about early warning signs and how to manage the disease. The third page of results is where you start to see more specific studies concerning MS. One discussed in depth why vitamin D might be a major factor in the early onset of the disease and another discussed how melatonin may be a major point of significant research in the near future. The rest of the links on this page seemed more about the soaring and outrageous costs of MS drugs and whether or not they are really all that effective especially from the cost standpoint. The fourth page primarily covered new studies outside of the United States but they really didn’t seem to offer a whole lot of information that I found to be new or exciting above what I already knew. What was interesting about the fifth page was a link that discussed the increase in multiple sclerosis diagnosis’ in Baby Boomers of which I belong to as well. And now that I think about it I have three risk factors for MS, I live on the boarder of Canada, I’m Scottish by heritage, and I’m Baby Boomer, no wonder I have this autoimmune disorder! I should have known. After the fifth page most of the links are just repeats or updated links from past. Although Jack Osbourn gets a link at the bottom of the page which is kind of funny since he beats Ann Romney by two pages. Ann Romney makes an appearance on page seven with a link to her site. And really that’s about it all the way through to page twenty six which was a lot of searching and very disappointing. I mean common, you would think at least one of my blog entries would have found its way into the top twenty six pages, since there is also a lot of junk mixed in there as well. Alright Goggle here’s your chance; sing it with me, to put my words of wisdom on The Front Cover of the Google search! This entry was posted in Humor, MS and Bill Walker, MS Treatments, Uncatagorized and tagged Ann Romney, Google, Jack Osbourn, Mayo Clinic, MS, MS in Canada, MS in Ireland, MS in Scotland, Multiple Sclerosis, National MS Society, Web MD on January 11, 2016 by msandbeyond. I haven’t considered where I’d show up in that google! lol I just google my name and am content!